Asia (/ˈeɪʒə, ˈeɪʃə/ ( listen)) is Earth's largest and most populous continent, located primarily in the Eastern and Northern Hemispheres. It shares the continental landmass of Eurasia with the continent of Europe and the continental landmass of Afro-Eurasia with both Europe and Africa. Asia covers an area of 44,579,000 square kilometres (17,212,000 sq mi), about 30% of Earth's total land area and 8.7% of the Earth's total surface area. The continent, which has long been home to the majority of the human population, was the site of many of the first civilizations. Asia is notable for not only its overall large size and population, but also dense and large settlements, as well as vast barely populated regions. Its 4.5 billion people (as of September 2018[update]) constitute roughly 60% of the world's population. In general terms, Asia is bounded on the east by the Pacific Ocean, on the south by the Indian Ocean, and on the north by the Arctic Ocean. The border of Asia with Europe is a historical and cultural construct, as there is no clear physical and geographical separation between them. It is somewhat arbitrary and has moved since its first conception in classical antiquity. 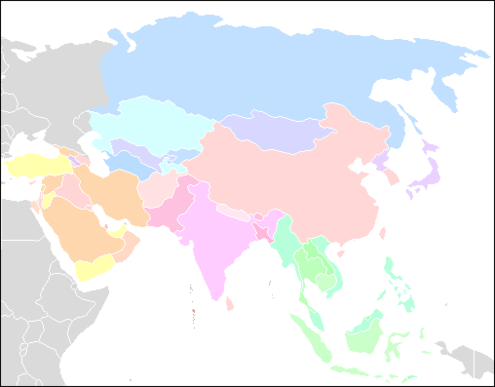 The division of Eurasia into two continents reflects East–West cultural, linguistic, and ethnic differences, some of which vary on a spectrum rather than with a sharp dividing line. The most commonly accepted boundaries place Asia to the east of the Suez Canal separating it from Africa; and to the east of the Turkish Straits, the Ural Mountains and Ural River, and to the south of the Caucasus Mountains and the Caspian and Black Seas, separating it from Europe. China and India alternated in being the largest economies in the world from 1 to 1800 CE. China was a major economic power and attracted many to the east, and for many the legendary wealth and prosperity of the ancient culture of India personified Asia, attracting European commerce, exploration and colonialism. The accidental discovery of a trans-Atlantic route from Europe to America by Columbus while in search for a route to India demonstrates this deep fascination. The Silk Road became the main east–west trading route in the Asian hinterlands while the Straits of Malacca stood as a major sea route. Asia has exhibited economic dynamism (particularly East Asia) as well as robust population growth during the 20th century, but overall population growth has since fallen. Asia was the birthplace of most of the world's mainstream religions including Hinduism, Zoroastrianism, Judaism, Jainism, Buddhism, Confucianism, Taoism, Christianity, Islam, Sikhism, as well as many other religions. In Sweden, five years after Peter's death, in 1730 Philip Johan von Strahlenberg published a new atlas proposing the Urals as the border of Asia. Tatishchev announced that he had proposed the idea to von Strahlenberg. The latter had suggested the Emba River as the lower boundary. Over the next century various proposals were made until the Ural River prevailed in the mid-19th century. The border had been moved perforce from the Black Sea to the Caspian Sea into which the Ural River projects. The border between the Black Sea and the Caspian is usually placed along the crest of the Caucasus Mountains, although it is sometimes placed further north. Geographical Asia is a cultural artifact of European conceptions of the world, beginning with the Ancient Greeks, being imposed onto other cultures, an imprecise concept causing endemic contention about what it means. Asia does not exactly correspond to the cultural borders of its various types of constituents. Geographically, Asia is the major eastern constituent of the continent of Eurasia with Europe being a northwestern peninsula of the landmass. Asia, Europe and Africa make up a single continuous landmass—Afro-Eurasia (except for the Suez Canal)—and share a common continental shelf. Almost all of Europe and the better part of Asia sit atop the Eurasian Plate, adjoined on the south by the Arabian and Indian Plate and with the easternmost part of Siberia (east of the Chersky Range) on the North American Plate. The idea of a place called "Asia" was originally a concept of Greek civilization, though this might not correspond to the entire continent currently known by that name. The English word comes from Latin literature, where it has the same form, "Asia". Whether "Asia" in other languages comes from Latin of the Roman Empire is much less certain, and the ultimate source of the Latin word is uncertain, though several theories have been published. One of the first classical writers to use Asia as a name of the whole continent was Pliny. This metonymical change in meaning is common and can be observed in some other geographical names, such as Scandinavia (from Scania). T.R. 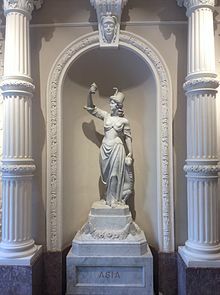 Reid supports this alternative etymology, noting that the ancient Greek name must have derived from asu, meaning 'east' in Assyrian (ereb for Europe meaning 'west'). The ideas of Occidental (form Latin Occidens 'setting') and Oriental (from Latin Oriens for 'rising') are also European invention, synonymous with Western and Eastern. Reid further emphasizes that it explains the Western point of view of placing all the peoples and cultures of Asia into a single classification, almost as if there were a need for setting the distinction between Western and Eastern civilizations on the Eurasian continent. Kazuo Ogura and Tenshin Okakura are two outspoken Japanese figures on the subject. A survey carried out in 2010 by global risk analysis farm Maplecroft identified 16 countries that are extremely vulnerable to climate change. Each nation's vulnerability was calculated using 42 socio, economic and environmental indicators, which identified the likely climate change impacts during the next 30 years. The Asian countries of Bangladesh, India, Vietnam, Thailand, Pakistan and Sri Lanka were among the 16 countries facing extreme risk from climate change. Some shifts are already occurring. For example, in tropical parts of India with a semi-arid climate, the temperature increased by 0.4 °C between 1901 and 2003. A 2013 study by the International Crops Research Institute for the Semi-Arid Tropics (ICRISAT) aimed to find science-based, pro-poor approaches and techniques that would enable Asia's agricultural systems to cope with climate change, while benefitting poor and vulnerable farmers. The study's recommendations ranged from improving the use of climate information in local planning and strengthening weather-based agro-advisory services, to stimulating diversification of rural household incomes and providing incentives to farmers to adopt natural resource conservation measures to enhance forest cover, replenish groundwater and use renewable energy. Asia has the largest continental economy by both GDP Nominal and PPP in the world, and is the fastest growing economic region. As of 2018[update], the largest economies in Asia are China, Japan, India, Russia, South Korea, Indonesia and Turkey based on GDP in both nominal and PPP. Based on Global Office Locations 2011, Asia dominated the office locations with 4 of the top 5 being in Asia: Hong Kong, Singapore, Tokyo and Seoul. Around 68 percent of international firms have office in Hong Kong. In the late 1990s and early 2000s, the economies of China and India have been growing rapidly, both with an average annual growth rate of more than 8%. 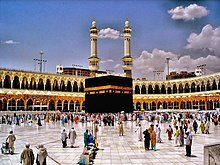 Other recent very-high-growth nations in Asia include Israel, Malaysia, Indonesia, Bangladesh, Pakistan, Thailand, Sri Lanka, Vietnam, Mongolia, Uzbekistan, Cyprus and the Philippines, and mineral-rich nations such as Kazakhstan, Turkmenistan, Iran, Brunei, the United Arab Emirates, Qatar, Kuwait, Saudi Arabia, Bahrain and Oman. According to Citigroup 9 of 11 Global Growth Generators countries came from Asia driven by population and income growth. They are Bangladesh, China, India, Indonesia, Iraq, Mongolia, Philippines, Sri Lanka and Vietnam. Asia has three main financial centers: Hong Kong, Tokyo and Singapore. Call centers and business process outsourcing (BPOs) are becoming major employers in India and the Philippines due to the availability of a large pool of highly skilled, English-speaking workers. The increased use of outsourcing has assisted the rise of India and the China as financial centers. Due to its large and extremely competitive information technology industry, India has become a major hub for outsourcing. In 2010, Asia had 3.3 million millionaires (people with net worth over US$1 million excluding their homes), slightly below North America with 3.4 million millionaires. Last year Asia had toppled Europe. Citigroup in The Wealth Report 2012 stated that Asian centa-millionaire overtook North America's wealth for the first time as the world's "economic center of gravity" continued moving east. At the end of 2011, there were 18,000 Asian people mainly in Southeast Asia, China and Japan who have at least $100 million in disposable assets, while North America with 17,000 people and Western Europe with 14,000 people. East Asia had by far the strongest overall Human Development Index (HDI) improvement of any region in the world, nearly doubling average HDI attainment over the past 40 years, according to the report's analysis of health, education and income data. China, the second highest achiever in the world in terms of HDI improvement since 1970, is the only country on the "Top 10 Movers" list due to income rather than health or education achievements. Its per capita income increased a stunning 21-fold over the last four decades, also lifting hundreds of millions out of income poverty. Yet it was not among the region's top performers in improving school enrollment and life expectancy. Hong Kong ranked highest among the countries grouped on the HDI (number 7 in the world, which is in the "very high human development" category), followed by Singapore (9), Japan (19) and South Korea (22). Afghanistan (155) ranked lowest amongst Asian countries out of the 169 countries assessed. 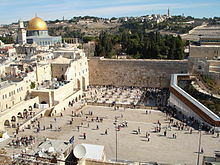 Judaism, the oldest of the Abrahamic faiths, is practiced primarily in Israel, the indigenous homeland and historical birthplace of the Hebrew nation: which today consists both of those Israelites who remained in Asia/North Africa and those who returned from diaspora in Europe, North America, and other regions; though various diaspora communities persist worldwide. Jews are the predominant ethnic group in Israel (75.6%) numbering at about 6.1 million, although the levels of adherence to Jewish religion vary. Outside of Israel there are small ancient Jewish communities in Turkey (17,400), Azerbaijan (9,100), Iran (8,756), India (5,000) and Uzbekistan (4,000), among many other places. In total, there are 14.4–17.5 million (2016, est.) Jews alive in the world today, making them one of the smallest Asian minorities, at roughly 0.3 to 0.4 percent of the total population of the continent. As of 2012[update], Hinduism has around 1.1 billion adherents. The faith represents around 25% of Asia's population and is the largest religion in Asia. However, it is mostly concentrated in South Asia. Over 80% of the populations of both India and Nepal adhere to Hinduism, alongside significant communities in Bangladesh, Pakistan, Bhutan, Sri Lanka and Bali, Indonesia. Many overseas Indians in countries such as Burma, Singapore and Malaysia also adhere to Hinduism. Spring Temple Buddha in Lushan County, Henan, China is the world's second-tallest statue. Buddhism has a great following in mainland Southeast Asia and East Asia. Buddhism is the religion of the majority of the populations of Cambodia (96%), Thailand (95%), Burma (80–89%), Japan (36–96%), Bhutan (75–84%), Sri Lanka (70%), Laos (60–67%) and Mongolia (53–93%). Large Buddhist populations also exist in Singapore (33–51%), Taiwan (35–93%), South Korea (23–50%), Malaysia (19–21%), Nepal (9–11%), Vietnam (10–75%), China (20–50%), North Korea (2–14%), and small communities in India and Bangladesh. In many Chinese communities, Mahayana Buddhism is easily syncretized with Taoism, thus exact religious statistics is difficult to obtain and may be understated or overstated. The Communist-governed countries of China, Vietnam and North Korea are officially atheist, thus the number of Buddhists and other religious adherents may be under-reported. 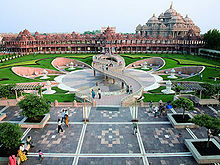 Jainism is found mainly in India and in oversea Indian communities such as the United States and Malaysia. Sikhism is found in Northern India and amongst overseas Indian communities in other parts of Asia, especially Southeast Asia. Confucianism is found predominantly in Mainland China, South Korea, Taiwan and in overseas Chinese populations. Taoism is found mainly in Mainland China, Taiwan, Malaysia and Singapore. Taoism is easily syncretized with Mahayana Buddhism for many Chinese, thus exact religious statistics is difficult to obtain and may be understated or overstated. Sir C.V. Raman is the first Asian to get a Nobel prize in Sciences. He won the Nobel Prize in Physics "for his work on the scattering of light and for the discovery of the effect named after him". ^ National Geographic Family Reference Atlas of the World. Washington, DC: National Geographic Society (U.S.). 2006. p. 264. ^ a b c "IMF (WEO October 2018 Edition) GDP nominal per capita – international dollar". ^ "Population of Asia. 2018 demographics: density, ratios, growth rate, clock, rate of men to women". www.populationof.net. Retrieved 29 September 2018. ^ a b National Geographic Atlas of the World (7th ed.). Washington, D.C.: National Geographic. 1999. ISBN 978-0-7922-7528-2. "Europe" (pp. 68–69); "Asia" (pp. 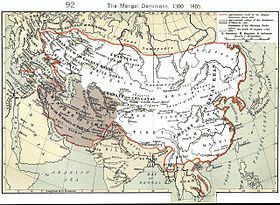 90–91): "A commonly accepted division between Asia and Europe is formed by the Ural Mountains, Ural River, Caspian Sea, Caucasus Mountains, and the Black Sea with its outlets, the Bosporus and Dardanelles." ^ Nalapat, M. D. "Ensuring China's 'Peaceful Rise'". Archived from the original on 10 January 2010. Retrieved 22 January 2016. ^ Dahlman, Carl J; Aubert, Jean-Eric. China and the Knowledge Economy: Seizing the 21st Century. WBI Development Studies. World Bank Publications. Accessed January 22, 2016. Eric.ed.gov. World Bank Publications. 2000. ISBN 978-0-8213-5005-8. Archived from the original on 4 March 2008. Retrieved 9 November 2017. ^ "The Real Great Leap Forward". The Economist. 30 September 2004. Archived from the original on 27 December 2016. ^ "Like herrings in a barrel". 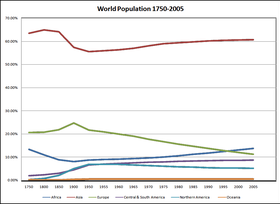 The Economist (Millennium issue: Population). 23 December 1999. Archived from the original on 4 January 2010. .
^ a b Neal Lineback (9 July 2013). "Geography in the News: Eurasia's Boundaries". National Geographic. Archived from the original on 8 May 2016. Retrieved 9 June 2016. ^ Schwartz, Benjamin (December 2008). "Geography Is Destiny". The Atlantic. Archived from the original on 30 September 2009. ^ a b c d e Reid, T.R. Confucius Lives Next Door: What living in the East teaches us about living in the west Vintage Books(1999). ^ "History – Black Death". BBC. 17 February 2011. Archived from the original on 5 June 2012. 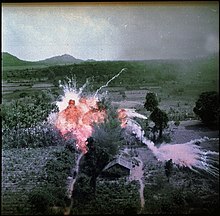 ^ Sen, Sailendra Nath (2010). An Advanced History of Modern India. p. 11. ISBN 978-0-230-32885-3. Archived from the original on 11 October 2017. ^ "A Map of the Countries between Constantinople and Calcutta: Including Turkey in Asia, Persia, Afghanistan and Turkestan". Wdl.org. 1885. Archived from the original on 17 October 2017. Retrieved 9 November 2017. ^ "World Economic Outlook (October 2018) – GDP, current prices". www.imf.org. ^ Farah, Paolo Davide (4 August 2006). "Five Years of China WTO Membership: EU and US Perspectives About China's Compliance With Transparency Commitments and the Transitional Review Mechanism". SSRN 916768. ^ Professor M.D. Nalapat (11 September 2001). "Ensuring China's "Peaceful Rise"". Bharat-rakshak.com. Archived from the original on 10 January 2010. Retrieved 1 June 2010. ^ Dahlman, Carl J; Aubert, Jean-Eric. China and the Knowledge Economy: Seizing the 21st century. WBI Development Studies. World Bank Publications. Accessed 30 January 2008. Eric.ed.gov. 2000. ISBN 978-0-8213-5005-8. Archived from the original on 4 March 2008. Retrieved 1 June 2010. ^ Fagoyinbo B, Joseph (2013). The Armed Forces: Instrument of Peace, Strength, Development and Prosperity. AuthorHouse UK. p. 58. ISBN 978-1-4772-1844-0. ^ "Asia has more millionaires than Europe". Toronto. Archived from the original on 25 June 2011. ^ a b c "2010 Human Development Report: Asian countries lead development progress over 40 years" (PDF). UNDP. Archived (PDF) from the original on 21 November 2010. Retrieved 22 December 2010. ^ World Jewish Population 2007 Archived 26 March 2009 at the Wayback Machine, American Jewish Yearbook, vol. 107 (2007), p. 592. ^ "World Jewish Population 2016 (DellaPergola, AJYB) | Berman Jewish DataBank". jewishdatabank.org. Retrieved 24 March 2018. ^ Encyclopaedia Britannica, Inc (2014). Britannica Book of the Year 2014. ISBN 978-1-62513-171-3. Archived from the original on 29 April 2016. Retrieved 13 March 2015. ^ "CIA – The World Factbook". Cia.gov. Archived from the original on 29 December 2010. Retrieved 20 December 2010. ^ a b c d e f g transcontinental country. Lewis, Martin W.; Wigen, Kären (1997). The myth of continents: a critique of metageography. Berkeley and Los Angeles: University of California Press. ISBN 978-0-520-20743-1. "Asia Maps". Perry–Castañeda Library Map Collection. University of Texas Libraries. Archived from the original on 18 July 2011. Retrieved 20 July 2011. Bowring, Philip (12 February 1987). "What is Asia?". Eastern Economic Review. 135 (7).